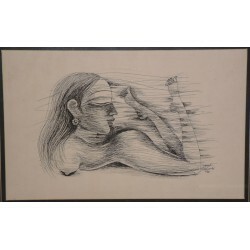 Laxman Pai born in 1926at Margao in Goa, received his art education at Sir `JJ School of Art in Mumbai and received the prestigious Mayo Medal for his work. He headed the Govt. 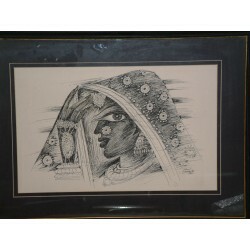 School of Art at Goa and is credited with having trained several well-known artists of today. His figurative paintings reflect the chance encounters and experiences of life and the society as he sees it. With bodies portrayed and faces in frontal profile his work appears to draw from ancient Egyptian sculptures while their bright colours seem influenced by Indian miniatures. His portriats and forms come rounded and defined with a touch of geometric patterns in vibrant hues. Marked for their detailed characteristics, bold palette and fine texture, the paintings add to the dramatics and intesity of the narrative. Laxman Pai born in 1926at Margao in Goa, received his art education at Sir `JJ School of Art in Mumbai and received the prestigious Mayo Medal for his work. He headed the Govt. School of Art at Goa and is credited with having trained several well-known artists of today. His figurative paintings reflect the chance encounters and experiences of life and the society as he sees it. With bodies portrayed and faces in frontal profile his work appears to draw from ancient Egyptian sculptures while their bright colours seem influenced by Indian miniatures. His portriats and forms come rounded and defined with a touch of geometric patterns in vibrant hues. Marked for their detailed characteristics, bold palette and fine texture, the paintings add to the dramatics and intesity of the narrative. Recipient of Padma Shri and honoured by the Government of Goa, and other awards, his work has been exhibited in over a hundred shows throughout India and abroad. His work is part of the collections held in museums at Delhi, Chandigarh, Paris, New york, Sao Paulo and Berlin amongst others. 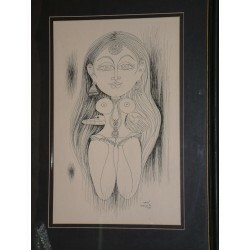 Laxman Pai lives in Delhi and works from his studio in the city.